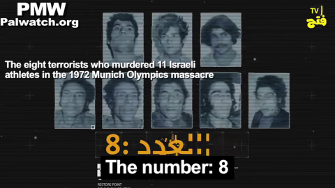 and made it hold its breath for more than 12 hours"
The world was enraged when 8 Palestinian terrorists from Fatah's Black September took 11 Israeli athletes and coaches hostage at the Olympics in Munich on September 5, 1972, and later murdered them. However, in Palestinian ideology the attack and the murders are presented as a "heroic" event to be proud of. 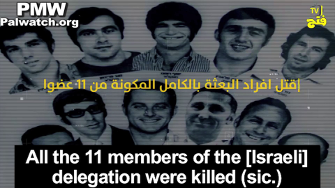 Palestinian Media Watch has documented that both the PA and Fatah continuously glorify the terror attack, the terrorists themselves, and those who planned it. Posted text: "The 46th anniversary of the heroic operation #Munich #The_symbols_of_the_Fatah_Movement_Lebanon #Be_strong_and_brave_homeland"
Abu Iyad (Salah Khalaf) - PLO Chairman Yasser Arafat's deputy, one of the founders of Fatah, and head of the terror organization Black September. 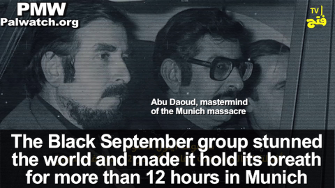 Attacks he planned include the murder of 11 Israeli athletes at the 1972 Munich Olympics and the murder of two American diplomats in Sudan (March 1, 1973). It is commonly assumed that his assassin, a former Fatah bodyguard, was sent by the Abu Nidal Organization, a rival Palestinian faction.